This is my second attempt at making a sponge roll. The first one was a disaster, the cake cracked when I rolled it. This time I used different recipe, and the result was fabulous. 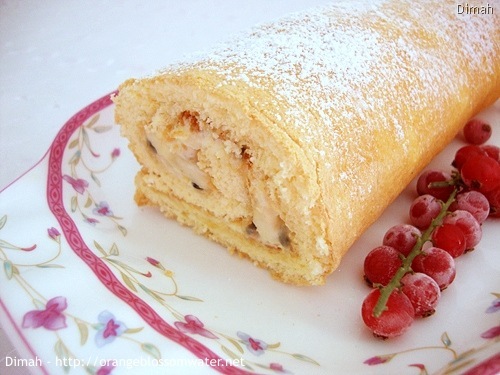 I filled the roll with eggless passion fruit curd mixed with whipped cream and sliced banana (the passion fruit curd in the original recipe is prepared with eggs), it was really delicious and I will make it again with different fillings. Preheat oven to 428 °F (220 °C). 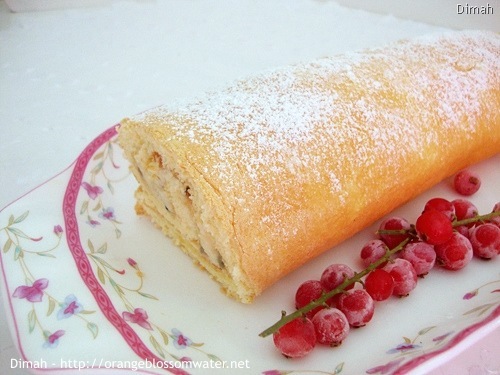 Line a 20 x 30cm (base measurement) Swiss roll pan with non-stick baking paper. 1, 2. Sift together the flour, baking powder and salt 3 times. 3. In a bowl, egg and sugar. 5, 6, 7. Use an electric beater to beat the eggs and sugar in a medium bowl until thick and pale, and a ribbon trail forms when beaters are lifted. 8. 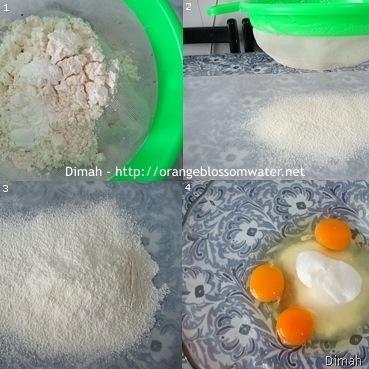 Use a large metal spoon to gently fold in the flour mixture. 9, 10. Spoon mixture into the lined pan and smooth the surface. Bake for 8 – 10 minutes or a skewer inserted into the center comes out clean. 11, 12. Immediately turn the cake onto a clean tea towel and remove the baking paper. Starting with the long side closest to you, and using the tea towel as a guide, gently roll up the cake. 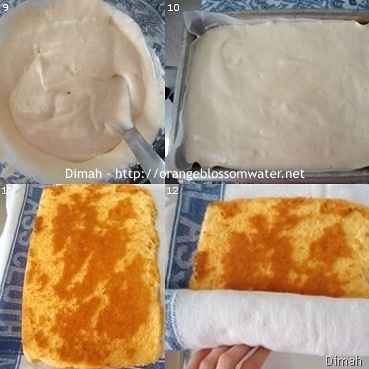 Wrap the tea towel around the cake and place, seam-side down, on a tray. 13. Set aside for 30 minutes to cool completely. 14, 15. Meanwhile, to make eggless passion fruit curd, In a saucepan, whisk together water, sugar, cornflour (cornstarch), and salt until cornflour is dissolved. 16. Bring mixture to a boil over medium heat, stirring constantly. When mixture thickens. Reduce heat to low and cook for another minute, stirring constantly. 17. This is the final mixture. 18. Pour mixture into a non-metallic bowl. 19, 20. 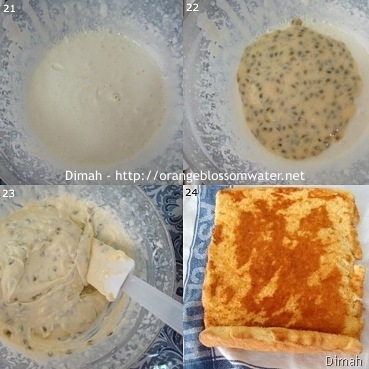 Add passion fruit pulp , mixing well. 21. Prepare whipped cream, I used 2 envelops of Dream Whip, and followed the instructions on the envelope. 22, 23. Add the passion fruit curd to the whipped cream and combine. 25. Spread evenly with the cream mixture. 27, 28. Roll up firmly to enclose the filling. 29. Dust with icing sugar. Banana, sliced Preheat oven to 428 °F (220 °C). 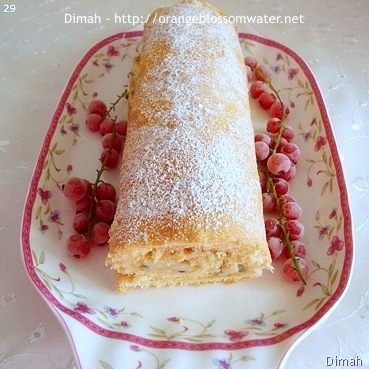 Line a 20 x 30cm (base measurement) Swiss roll pan with non-stick baking paper. Sift together the flour, baking powder and salt 3 times. In a bowl, egg and sugar. 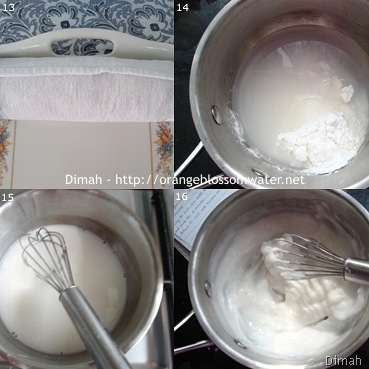 Use an electric beater to beat the eggs and sugar in a medium bowl until thick and pale, and a ribbon trail forms when beaters are lifted. Use a large metal spoon to gently fold in the flour mixture. Spoon mixture into the lined pan and smooth the surface. Bake for 8 – 10 minutes or a skewer inserted into the center comes out clean. Immediately turn the cake onto a clean tea towel and remove the baking paper. Starting with the long side closest to you, and using the tea towel as a guide, gently roll up the cake. Wrap the tea towel around the cake and place, seam-side down, on a tray. Set aside for 30 minutes to cool completely. Set aside for 30 minutes to cool completely. Meanwhile, to make eggless passion fruit curd, In a saucepan, whisk together water, sugar, cornflour (cornstarch), and salt until cornflour is dissolved. Bring mixture to a boil over medium heat, stirring constantly. When mixture thickens. Reduce heat to low and cook for another minute, stirring constantly. This is the final mixture. 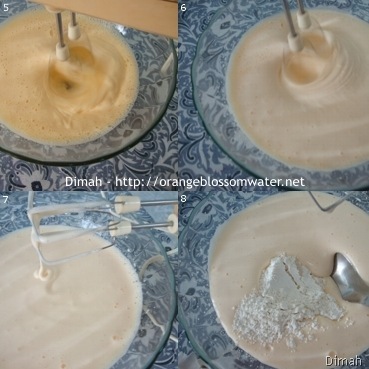 Pour mixture into a non-metallic bowl. 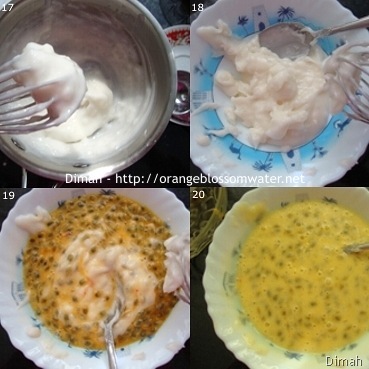 Add passion fruit pulp , mixing well. Prepare whipped cream, I used 2 envelops of Dream Whip, and followed the instructions on the envelope. Add the passion fruit curd to the whipped cream and combine Unroll the cake. Spread evenly with the cream mixture. 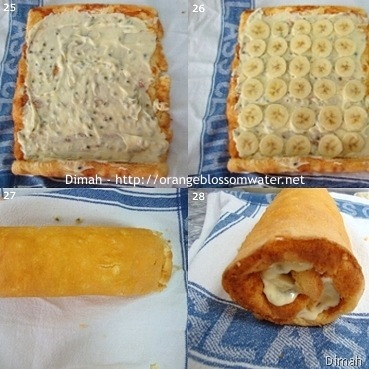 Add banana slices. Roll up firmly to enclose the filling. Dust with icing sugar. I didn’t use all the quantity of the cream mixture (passion fruit curd mixed with whipped cream), so I served the remaining with the roll. If you want to make passion fruit curd with eggs, go to the original recipe in taste.com.au I used Dream whip, and didn’t add sugar to the whipped cream. This entry was posted on Monday, March 15th, 2010 at 2:47 PM	and is filed under Baking and Desserts. You can follow any responses to this entry through the RSS 2.0 feed. You can skip to the end and leave a response. Pinging is currently not allowed. mmm looks really good! I had that problem once! I made rolls with a spongecake and it was a disaster! So I just ended up making it with a cake mix! Oh this looks lovely! 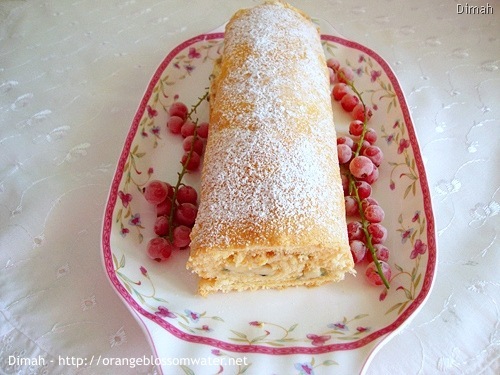 I’ve been meaning to make a sponge roll for ages, I should get onto it. I love the name of your blog and thank you for your comment on my little cakes! 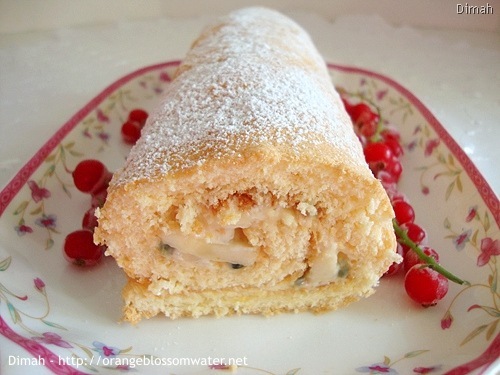 Would you believe I have made a passion fruit curd (with eggs) and was going to make the same thing, a jelly roll! How funny! Mine is going to be a bit different though, but I hope just as good as yours! Zahra: Thank you so much for coming by! Emma: Thank you for stopping by and for your kind words! tasteofbeirut: Thanks for visitng! hope you enjoy the roll! I’ve never been successful when it comes to rolls. I will have to bookmark this and put in my to do list. Thanks for visiting my blog and for the kind comment. Tafa luto (Pia): Thanks for coming by and for kind comment!